In this chapter, the process of sediment erosion and resuspension was studied through in situ observations and wave flume experiments. 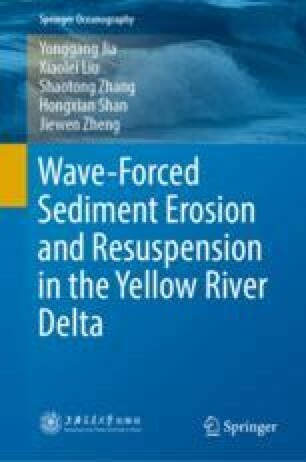 Sediments are more frequently resuspended by wind waves in the Yellow River Delta, the contribution of waves and currents to sediment resuspension was evaluated while also a conceptual model for sediment resuspension in this delta area was constructed. More importantly, our wave flume experiments found that once seabed liquefaction occurred, the process of sediment resuspension could be significantly changed. More sediments would be resuspended in addition to that eroded by wave orbital velocities, and these lately resuspended sediments seems to come from the interior of the seabed, rather than seabed surface as the conventional opinion holds.